Highlights from the Chelsea Art Museum before it Closes. “Highlights of CAM,” curated by Elga Wimmer, brings together pivotal works from four earlier exhibits, whose formal inter-relationships create a connecting thread that accentuates the collaborative spirit that is the Museum’s hallmark. After nine productive years, the Chelsea Art Museum, home of the Jean Miotte Foundation, is closing its Chelsea location, with plans to relocate. The future setting is still in question, although Fribourg, Switzerland, a city in close proximity to Geneva, is under consideration. Most currently, a possible move in Chelsea is being contemplated! “Highlights of CAM,” curated by Elga Wimmer, brings together pivotal works from four earlier exhibits, whose formal inter-relationships create a connecting thread that accentuates the collaborative spirit that is the Museum’s hallmark. Simultaneously, the current show, “Asian Variegations,” curated by Thalia Vrachopoulos, displays works of diverse media, by Asian artists whose modular compositions bridge traditional form to create geometric configurations that speak to a particularly Asian organizational structure. The works selected from the show “Abstraction Revisited” bring a number of abstract genres into proximity that highlights diversity while it builds parallels between the inherent energy of the works and their formal elements of color, gesture and line. 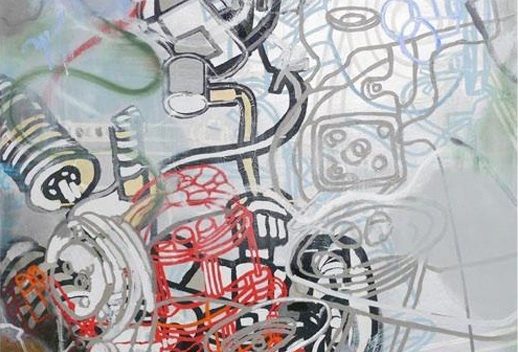 Lydia Dona’s “Love Affairs in the Freeze” (2011), features entwined machine parts within a gray and pink palette, that makes a connection with the predominately gray tones and abstracted machinery in Roberto Matta’s “Untitled” (1962), establishing a sense of the unity of these two artistic visions. 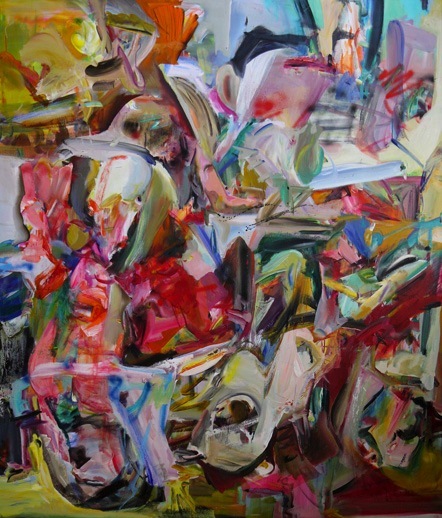 In her painting, “Failing Eye” (2010), Haeri Yoo brings a full palette of strong edgy hues to a composition in which she pushes the colors to the brink, but manages to establish a high-keyed harmony that guides the viewer through the work in an emotionally charged visual experience. 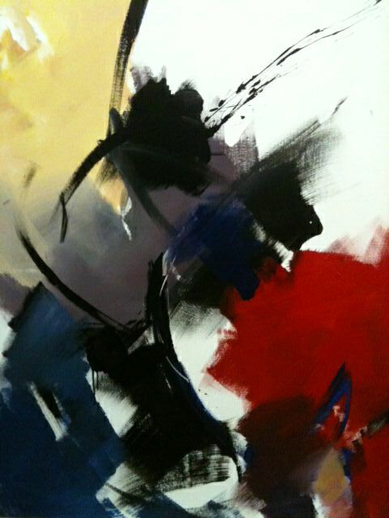 Jean Miotte’s ultra free “L’Art Informel” gestural paintings represent the European rendition of Abstract Expressionism in their intuitive process, bold spontaneity, and departure from tradition and observed form. The exalted soaring brushwork brings to mind birds in flight or the vaulted space of a gothic cathedral. His disillusion with modern progress is expressed in a universal abstract language meant to break national boundaries to foster communication among cultures and individuals. The works on view in “Goya and Here Comes the Bogey-man” express human failings and weaknesses- vanity, arrogance, violence, injustice and ignorance- that are imbued in Goya’s works from the “Los Caprichos” series to “The Sleep of Reason Produces Monsters.” Rona Pondick’s bronze sculpture entitled “Ram’s Head Wall” (2000-2001) is a powerfully realized self-portrait in the form of a human-animal head with horns attached, in a nod to the eternally recognized symbol of the dark side. 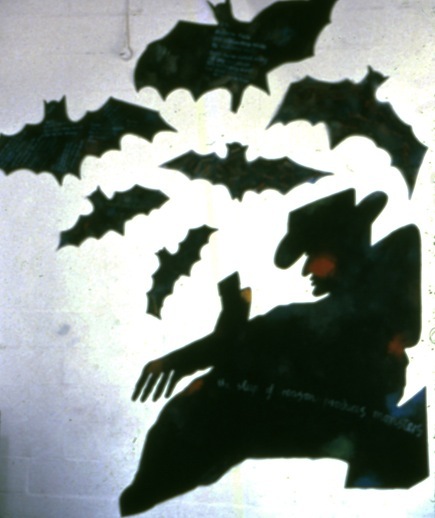 Conrad Atkinson’s helter-skelter flat cut out bats in the installation “The Sleep of Reason Produces Monsters” (1985), surge menacingly around a looming black figure, inspiring feelings of doom and foreboding. In light of the atrocities committed in the twentieth century, it is no wonder that European artists lost faith in progress; the abiding negative characteristics of Goya’s Caprichos are revealed here, as vigorously active today as ever, highlighted in the depiction of a power struggle for dominance in Saint Clair Cemin’s bronze sculpture, “One Century Smites Another” (1999). The show “Toward the Creation of a New Female Myth” is represented by So-Bin Park’s black and white wrap-around figural wall work on paper. The foreboding large-scale figure seems entranced by morbid contemplations and mysterious musings. 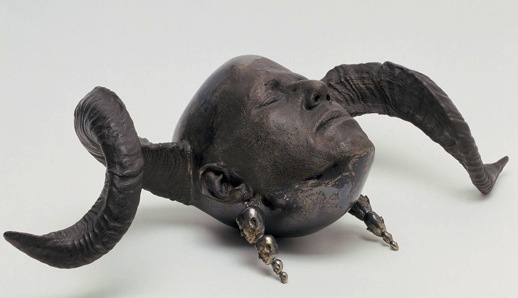 It expresses a bleak, moody vision of vulnerability that speaks to the dominant theme of the “The Sleep of Reason Produces Monsters” wall work, and the “Ram’s Head” sculpture. The drawing leads the viewer to the group exhibition “Asian Variegations,” a multi-media display by contemporary Asian artists which includes installations of black and white symbolic drawings, paintings, and an intricate photographic piece organized in a loose grid, to name only a few of the works on view. The show represents the Asian proclivity for art comprised of modular interactive components that create unified installation pieces. Several of the installations form geometric configurations whose varied parts speak to one another. Through both abstract and representational art, “Highlights of CAM” expresses the individual freedom and thoughtful endeavor that keeps art both fresh and universal. 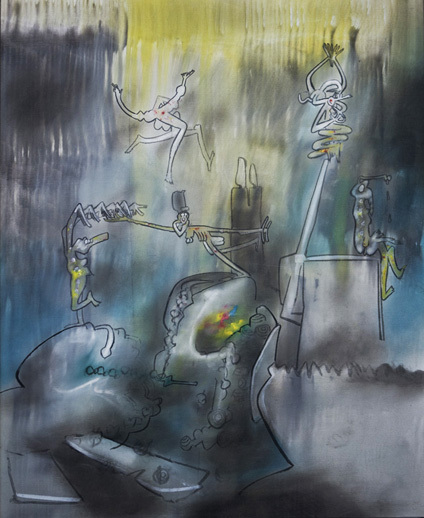 The spirit of independence, the sense of exploration, and the courage to follow one’s muse are supported and championed by the exposure this contemporary museum sees as its mission, in its on-going incisive efforts to bring to the public thought-provoking juxtapositions of underexposed contemporary art that stirs individual critical thought and experience.